Adapted from the TV series of the same name in which veterinarian Nacho (Eduard Fernández) interacted with a different woman in each episode, Mariano Barroso’s film compresses the story down into not much more than a 24 hour period wherein Nacho’s life implodes. I’m not going to say what the exact turn of events are, because it’s something that is revealed gradually, but ‘plot’ is also somewhat superfluous to the real point of the film: a study in character. Nacho would have it that this implosion is the responsibility of others, anyone other than himself in fact, but as the layers of his self-deluding subterfuge are peeled away in his conversations with each individual woman, the viewer realises that this is a situation entirely of his own making. Although Nacho makes reference to his father-in-law (someone he is fearful of) and a male friend, it is the women in his life to whom he turns when he’s in trouble: his lover (Jenner), his wife (Quintana), an ex-girlfriend who he asks for legal advice (Morales), his mother (Martínez), his sister-in-law (Larralde), and finally a psychologist (Poza) who he hopes will label his behaviour ‘temporary insanity’. But what his relationships with the women reveal is that there is nothing temporary about Nacho’s behaviour – a pattern emerges of bad choices and poor judgement, and of emotional devastation left in his wake – he has contacted people who he thinks will enable and support his self-justifications, but instead finds that those with some distance or long-term experience of his methods (his ex, his mother, and the psychologist) cut straight through his nonsense and have little patience for his evasions of the truth (‘Who was that Nazi who said “When I hear the word ‘culture’ I reach for my gun?”‘ – his mother asks – ‘Well, Nacho, when I hear your name, I reach for my chequebook’). Although their skins have hardened over the years he is still capable of wounding those women (Poza’s character aside), but it is with the other three women that we see (or hear, in the case of Jenner) the rawness of betrayal and the aftermath of Nacho’s need to belittle them in order to make himself feel big. ‘I’m not a bad person’, he says more than once, and yet in his manipulations, cowardice, and casual cruelties towards the women, it is difficult to call Nacho ‘a good man’. In the hands of a lesser actor, Nacho could have ended up being a one-note weasel and our sympathies for the women stretched by incredulity at their willingness to endure his flights of self-deluding fancy. 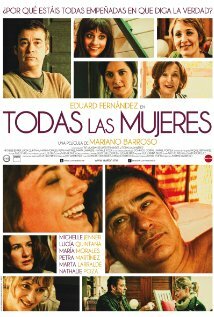 But Barroso knew what he was doing in casting Eduard Fernández (they have worked together multiple times before). Fernández is a compelling presence in whatever size role he takes on (and one of the best onscreen smokers – revealing character and unspoken thoughts – if someone were to make a film simply of him smoking, I would watch it). He is the backbone of the film (he is in every scene) and makes it believable that each of these women would respond to Nacho’s call for help no matter how he may have treated them in the past. His female counterparts match the quality of his performance by offering subtle and complex representations of sparky women whose vulnerabilities and tendernesses make them all too believably human. What stops the viewer writing Nacho off, and keeps us engaged in his plight, is the company he keeps – they have all at some point seen something worthwhile in him. This is an actor’s film, insofar as the camera work is unshowy (handheld and nothing ostentatious – and nearly the entire film takes place in Nacho’s house) and the interactions are mainly conducted in close-up or medium close-up, allowing the actors to build character through body language and comportment with the camera close enough to capture every nuanced emotion that flits across their faces. I would be interested in seeing the original TV series, which featured the same cast, to see where else they took the characters.